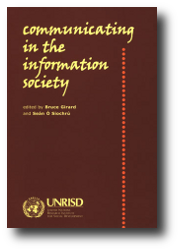 On the occasion of the first World Summit on the Information Society (WISIS), which is also the first UN-sponsored world summit to specifically seek the formal participation of civil society, the United Nations Research Institute for Social Development (UNRISD) decided to emphasize the importance of societal perspectives on information society debates. It invited Bruce Girard and Seán Ó Siochrú of Communication Rights in the Information Society (CRIS), a civil society coalition active in the WISIS process, to select and edit a collection of essays on what they saw as core issues. The contribution in this book cast a spotlight into dark, often neglected, corners of the “information society” as articulated in the World Summit on the Information Society. Several very different layers are illuminated, from the philosophical underpinnings of the role of information in society, to the context and manner in which the concept has recently emerged into global consciousness, to how it can be deployed in practice to maximize benefits to society. An edited volume is well suited to covering these diverse ways of thinking about the topic as it offers the opportunity to bring together authors with different backgrounds and approaches. A Community Informatics for the Information Society – William McIver Jr. Communicating in the Information Society was launched at the World Summit on the Information Society.